Recent advances in the imaging technique electron microscopy (EM) have improved the method, making it more reliable and rewarding, particularly in its description of three-dimensional detail. Cellular Electron Microscopy will help biologists from many disciplines understand modern EM and the value it might bring to their own work. The book’s five sections deal with all major issues in EM of cells: specimen preparation, imaging in 3-D, imaging and understanding frozen-hydrated samples, labeling macromolecules, and analyzing EM data. Each chapter was written by scientists who are among the best in their field, and some chapters provide multiple points of view on the issues they discuss. Each section of the book is preceded by an introduction, which should help newcomers understand the subject. 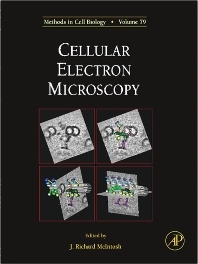 The book shows why many biologists believe that modern EM will forge the link between light microscopy of live cells and atomic resolution studies of isolated macromolecules, helping us toward the goal of an atomic resolution understanding of living systems. Researchers in various fields of biology who utilize electron microscopy.